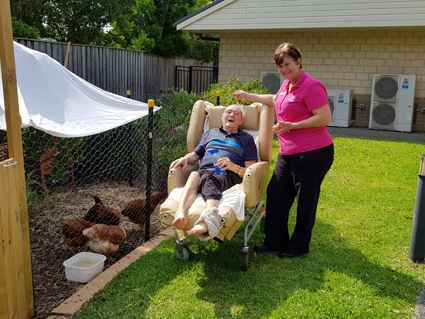 “The Chook Man” has arrived at Ridgeview Aged Care in Albion Park, and was delighted to find a chicken therapy program up and running at the Home. 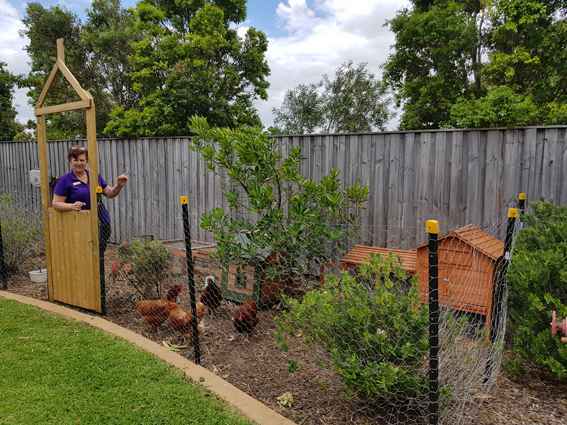 New resident Gordon has been known in the local community as ‘The Chook Man’, after supplying the local community with feathered pets, as well as inviting children and adults to watch chicken hatching from their shells. 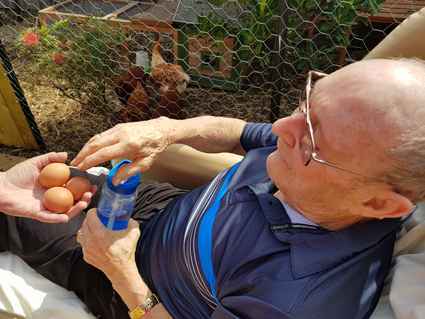 Gordon was thrilled to discover that Ridgeview had our very own chickens who are now laying eggs on a daily basis, as part of a pet therapy program. He has been visiting Ridgeview’s chickens with staff and advised that we have Isa Browns and educated staff on how we can best care for them and their egg laying routines. Gordon’s room proudly displays chook paraphernalia and he even wears a gold rooster pendant round his neck at all times! Find out more about our Pet Therapy programs.